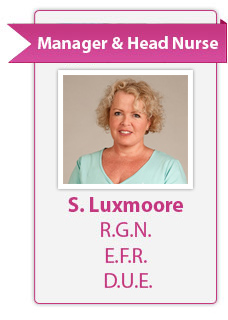 Sally Luxmoore is a qualified nurse, registered in the U.K. and Spain. She has been living and working in Mallorca since 1990, where gaining experience in providing specialist care on a one-to-one basis within the Mallorcan community. Established in 2003 and re-branded in 2004, Angels Nursing and Babysitting Agency is a leading provider of health care workers in the Balearics. "My aim, as a nurse, is to provide a local, professional service giving immediate, flexible, quality nursing and care support by the best selection and continuity of nurses and carers available. It’s a matter of pride to us all." "We begin with a personalised initial visit, free of charge, to identify and establish individual requirements, followed by customised recommendations. Our rates are highly competitive, and we are proud to be able to implement nursing care at short notice - with no compromise in quality." "You can be assured of our personal attention, total confidentiality, flexibility and the highest level of care at all times, in all situations." "Our success is built on the quality of our dedicated 'Angels'"
"Our reputation for excellence and reliability is unparalleled. Should assistance be required out of office hours, calls will be dealt with by the on-call Registered Nurse who will offer immediate advice and support. This service is available 365 days a year." "We deliver an exceptional service to both our patients and our clients by ensuring every nurse we represent meets the most rigorous professional standards. One of our main assets is that we LISTEN to our client and like to see ourselves as trusted friends and a caring TEAM." We currently employ a large number of kind, professional babysitters, highly trained and experienced health care assistants and various levels of Qualified and specialist nurses. All our 'Angels' have their references rigorously checked prior to joining Angels Nursing and Babysitting Agency and once recruited they receive a supervision programme along with all available training, in order to maintain standards, update knowledge, and provide ongoing career development. We are able to provide holistic care to clients with any variety of needs. We provide care and assistance from the beginning of life to the end: providing information and assistance during pregnancy, with the newborn, throughout childhood and with any aspect of illness, disease or disability, including those with dementia, the elderly and infirm. We also have a large network of professional contacts, and work alongside the clients' own doctors and specialists, ensuring optimum care and support for the client and their family." Vision - "To be the premier supplier of highly trained, highly motivated healthcare professionals and babysitters".